How biomass can bias high-throughput surveys of microbial communities – microBEnet: the microbiology of the Built Environment network. Puffballs are a type of fungus that is aptly named. 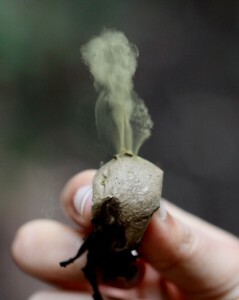 You can ‘puff’ their ball-shaped fruiting bodies, and so many spores come out (a large one can contain 7 million), they make a visible cloud. This ostentatious and satisfying practice makes puffballs a popular choice for novice mushroom hunters tasked with bringing in specimens for a university course on mushrooms. During one semester in which such as mushroom course was taught, we sampled airborne fungi in five teaching labs by collecting the dust that passively settled on a sterile surface. One lab held the mushroom course, while the neighboring labs did not request that students intentionally bring in locally collected fungal specimens for identification and discussion. We wanted to know what kind of influence these intentional introductions to the indoor environmental would have on airborne fungal communities as detected by next-generation, high-throughput sequencing. Cue Sesame Street — one of these things was not like the other. Fungal sequences from the laboratory classroom with the mushroom course were overwhelmingly those of puffballs, while the other classrooms had a more diverse set of fungi typical to indoor environments. Surprisingly, these typical indoor fungi were largely absent from the mushroom lab sequences, even though the total amount of fungal material collected was many times higher in the mushroom lab. This skew — where the mushroom lab had higher fungal biomass but looks as though it has fewer numbers of fungal types — came about because of a bias in the standard methods for high-throughput sequencing: each sample got sequenced to a common concentration of amplified material, regardless of how much fungal material there was to amplify originally. So, using this standard method, high biomass samples (in this, the air samples from the mushroom course) have less of the microbial community analyzed relative to the low biomass samples (the air samples from all the other labs). I see two lessons of this study that are more generally applicable than this artificial environment of mushroom teaching labs. The first applies to all high-throughput sequencing of microbial communities, and the second to the indoor microbiome in particular. One, getting some idea of the biomass across samples allows you to better interpret compositional differences. Our data showed that the mushroom lab had fewer fungal types that were largely limited to that classroom. However, because of the environmental setting and the higher biomass, we could deduce that the mushroom lab most likely has greater fungal types: the typical indoor fungi plus these introduced specimen. Because of this contrived setting, we knew to look for biomass differences, but in other microbial environments, biomass is not something typically measured. These results show that if large biomasses differences do exist but go unmeasured, you could be incorrectly interpreting diversity differences. That is, just because some taxa do not appear in the samples does mean they are not there. It could just mean that these other types would be found if you could sequence more of the sample (and that’s why “saturating the curve” will help eliminate this problem). Two, I ran this experiment concurrently with a systematic study of indoor residences, which ultimately showed that in healthy buildings the indoors largely tracked what was outside. Based on that study, I now design all experiments to include a comparable outdoor sample, something I wish I had for this study, too. If I did, I would know definitively what was the common outdoor source for all of these rooms and would therefore be better able to understand the processes that are operating indoors specifically. Turns out, the airborne fungi are just one more reason the mushroom class is like no other. The full paper is here (and open-access).